Steve Gulbin had a hole in one on the 4th hole in the 3 person ambrose on October 14th - 'Pity it wasn't the money'hole. The Kioti and Alex could not be stopped. 100% Supervison Great work by our many volunteers. 2018 NEDGA Championships: Winners of the Swan Trophy, Judy Fogarty, Carol Myles, Denise Perkin and Jackie O'Brien. More winners from the Parsons Bowl: Young Chick - Donna Sedgeman from Mansfield, Veteran - Chris Boseley and Super Veteran - Bruna McDonald. 2018 JGC Ladies Champions: Secret 18 - Vicki Morhead, B Grade - Linda Stone, Club Champion - Kay O'Shea, 54 Hole handicap champion - Mary Jones and C Grade - Robyn Ottaway. 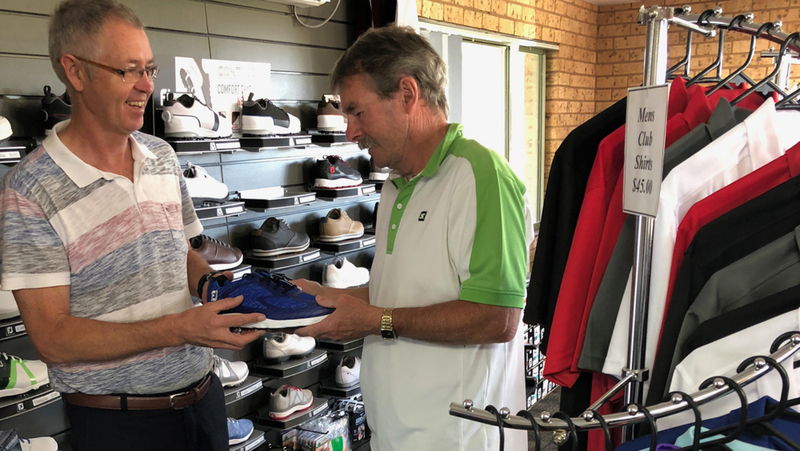 Great gear in Pro Shop - the blokes and the shoes!